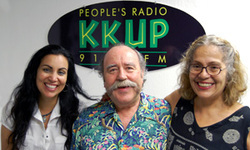 Thankyou to DJ Joe Sodja for a very gracious interview in the South Bay on his Weds night radio program on KKUP. Put your boots on and get ready for the Muses, Dust Devils and Demons of Tara Linda's desert world. This roots music, inspired by the land and storeis of the American Southwest, blends spaghetti Western, Tex-Mex, and rock. Wayward and whipsmart, the album offers both musical depth and whimsy. "This journey" Tara Linda says "started with one desert-inspired song (Dream out Loud), and took me from California into Arizona & Texas. I let the dust devils & tumbleweeds lead the way, sometimes back to a ghost town or Mission where a song was first inspired." This CD is a celebration of the Southwest in stories. Wildwest visitors include a sassy Muse who challenged Tara to a do-or-die showdown in the Plaza (Muse's Duel); Teresita de Cabora on her train ride escape from Mexico (Teresita). There are natural disasters (including love), and a song to welcome soldiers home (Soldier's Homecoming). 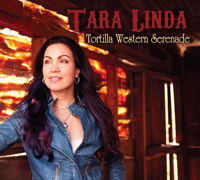 Tara wrote the lyrics and music for most songs, and shared songwriting collaboration on 4 tunes with friends Gilberto Reyes, Az Samad, and Max Baca. Digital download directly from my website. I'll be posting to my blog more details on the Muses and the places they take me in music, poetry, & jewelry. Thank you all so much for supporting me & coming to my shows!!! I can't do this without You!! I'm excited to be joining Los Texmaniacs as a guest on a tour of China: July 16 thru July 30. I'll be posting updates and pics on Facebook. I Journeyed into South Texas with music partner Gilberto Reyes~ this is a lively bilingual CD with a very special group of musicians celebrating varied Latin roots influences, including South Texas Conjunto. The album includes boleros, rancheras, a devilsh cumbia, a sensuous tango- many sung in the old dueto style with Gilberto. 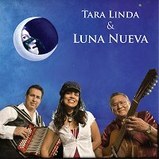 This 2008 album, named New Moon, is dedicated to the life and legend of Lydia Mendoza. 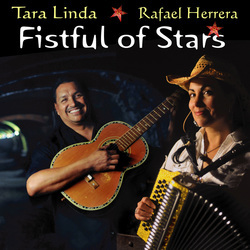 Musicians on this album included El Maestro Santiago Jimenez, Jr., Gilberto Reyes (Reyes Accordions), Los Maestros Pete Hernandez, and Hilario "Layo" Jimenez, and Jeff Hobbs. as honored to sing in the "Tribute to Lydia Mendoza" with Luna Nueva this Spring at the Tejano Conjunto Festival in May. For the last several years, I've been very inspired by the music sung and played by the women of South Texas, especially, Lydia's. Lydia Mendoza was a inspiring legend, who, beginning in the 1920's in South Texas, played 12-string guitar and sang Conjunto~ a type of folk music that developed along the Texas/Mexican border. Lydia sang a seemingly endless repertoire of songs, originally to the working class moving between the U.S. and Mexico. She is credited with recording over 500 songs! It was my love of the accordion that led me to her, but hers was a style before the accordion became popular, before dance halls and dancing; soul-filled songs of hard living, lost love, and longing - not unlike American blues or Portuguese fado. We sang "Amor Bonito" written by Lydia, and featuring the one and only El Maestro Santiago Jimenez, Jr. on accordion!